Details can be found on the Play Day page or by clicking here. Ludlow Orchestra is an enthusiastic amateur orchestra consisting of around fifty players. It draws its members from Ludlow in South Shropshire and surrounding area. We meet fortnightly on Sunday evenings in Wistanstow Village Hall, just north of Craven Arms, off the A49. The orchestra performs up to three concerts each year locally. 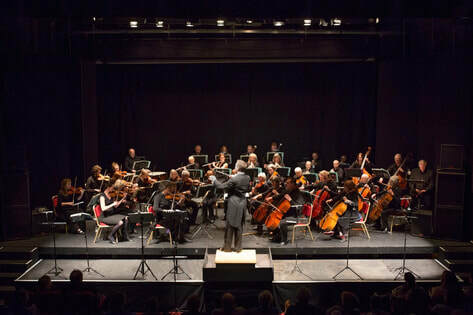 Ludlow Orchestra was founded in 1970 as a string orchestra to accompany Ludlow Choral Society. There are currently vacancies for cello, French horn, tenor trombone and timpani players. Extra string players are always welcome. Please contact us if you are interested in joining the orchestra. Our main rehearsal venue is Wistanstow Village Hall, SY7 8DQ. Doors which can be unlocked on the northwest (far) side of the hall give full wheelchair access. There are no steps in the parts of the hall that we use and there is a disabled access toilet. Occasionally we rehearse in Henderson Hall at Moor Park School, SY8 1AJ. Here, there is one step up from ground level outside the door and then a further, similar step at the door to access the hall. If required, and with some advance notice, a ramp can be put out to allow wheelchair access. There is no disabled access toilet. ​Both rehearsal venues have free unlimited parking right outside. The main area of our concert venue, St Laurence’s Church, Ludlow, is level and most steps in the church can be avoided for our purposes but we do use tiered staging. This is flexible and can be arranged to suit everyone. There is a disabled access toilet and the nearest disabled parking spaces are about 60m away. Please contact us for further details and to let us know how we can help you. Ludlow Curtain Company. ​5 The Angel, Broad Street Ludlow, SY8 1LT. Tel: 01584 875533. Email ludlowcurtains@hotmail.co.uk. Fabrics, wallpapers, curtains, blinds, paints. is a charity helping to educate children in circumstances where they wouldn't normally receive any education'.